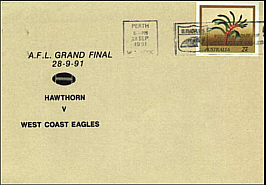 The West Coast Eagles became the first Non Victorian team to play in an AFL/VFL Grand Final. Their inclusion in the final series was initially marked by the introduction of a slogan cancellation used at the Perth GPO during September. This was first used in 1991. It was also used to cancel this private PSE with 27c Kangaroo Paw, the State Floral Symptom of WA (PSE No 51) shown below. Unfortunately the Eagles went down to Hawthorn, the final scores being Hawthorn 20-19-139 to West Coast 13-8-86. It was attended by 75,230 and was played at Waverley Park, then called VFL Park, due to the building of the Great Southern Stand at the MCG. It was the first grand final not to be played at the MCG since the ground was taken over by troops during the second world war in 1942 to 1944.